A University of Nebraska-Lincoln archeological team has uncovered a massive Roman mosaic in southern Turkey—a meticulously crafted, 1,600-square-foot work of decorative handiwork built during the region's imperial zenith. It's believed to be the largest mosaic of its type in the region and demonstrates the surprising reach and cultural influence of the Roman Empire in the area during the third and fourth centuries A.D., said Michael Hoff, Hixson-Lied professor of art history at UNL and the director of the excavation. "Its size signals, in no small part, that the outward signs of the empire were very strong in this far-flung area," Hoff said. "We were surprised to have found a mosaic of such size and of such caliber in this region – it's an area that had usually been off the radar screens of most ancient historians and archeologists, and suddenly this mosaic comes into view and causes us to change our focus about what we think (the region) was like in antiquity." 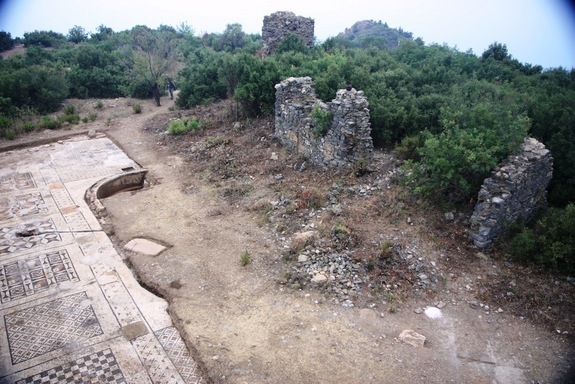 Since 2005, Hoff's team has been excavating the remains of the ancient city of Antiochia ad Cragum on the southern Turkish coast. Antiochus of Commagene, a client-king of Rome, founded the city in the middle of the first century. "This region is not well understood in terms of history and archeology," Hoff said. "It's not a place in which archaeologists have spent a lot of time, so everything we find adds more evidence to our understanding of this area of the Roman Empire. "We're beginning to understand now that it was more Romanized, more in line than the rest of the Roman world than was suspected before. (The nature of the mosaic) hammers home how Roman this city truly is." Excavation has focused on a third-century imperial temple, and also a colonnaded street lined with shops. 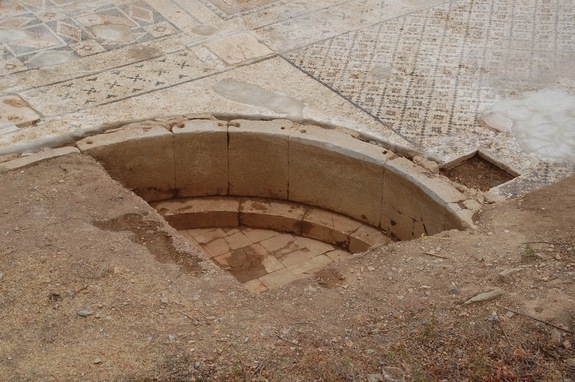 In July, the team began to explore the mosaic, which was part of a Roman bath. The decoration consists of large squares, each filled with different colored geometric designs and ornamentation. "This would have been a very formal associated pavement attached to the bath," Hoff said. "This is a gorgeous mosaic, and its size is unprecedented" – so large, in fact, that work crews have uncovered only an estimated 40 percent of its total area. 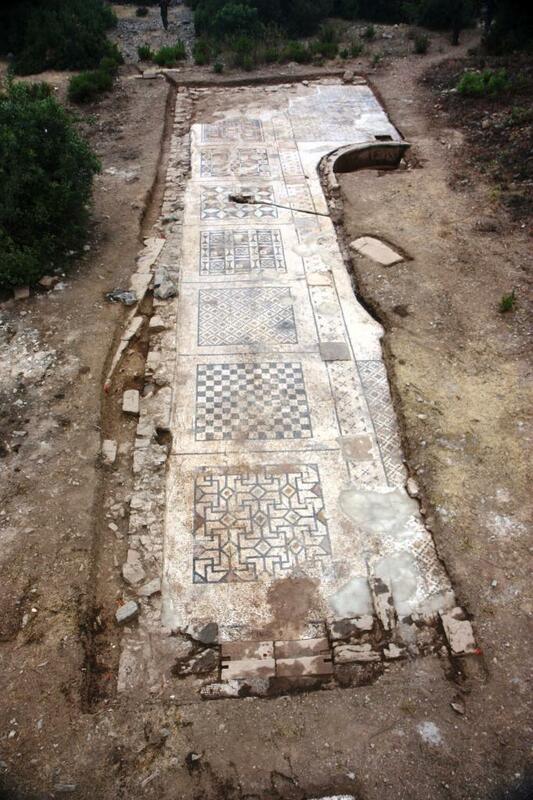 Hoff said it appears the mosaic served as a forecourt for the adjacent large bath, and that at least on one side, evidence shows there was a roof covering the geometric squares that would have been supported by piers. Those piers' remains are preserved, he said. Meanwhile, the middle of the mosaic was outfitted with a marble-lined, 25-foot-long pool, which would have been uncovered and open to the sun. 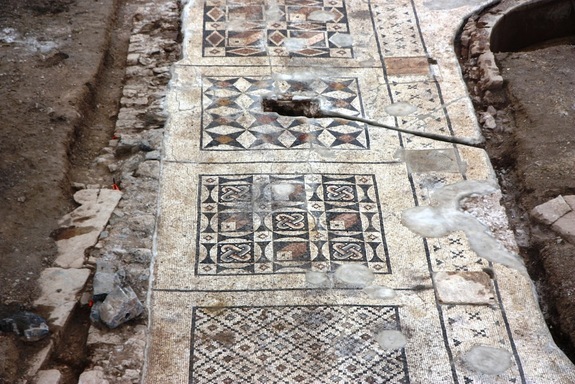 The other half of the mosaic, adjacent to the bath, has yet to be revealed but is expected to contain the same type of decoration, Hoff said. Crews expect to unearth the entire work next summer. Team members first noticed the mosaic in 2001 when a large archaeological survey project that included Hoff noticed plowing by a local farmer had brought up pieces of a mosaic in a field next to a still-standing bath structure. 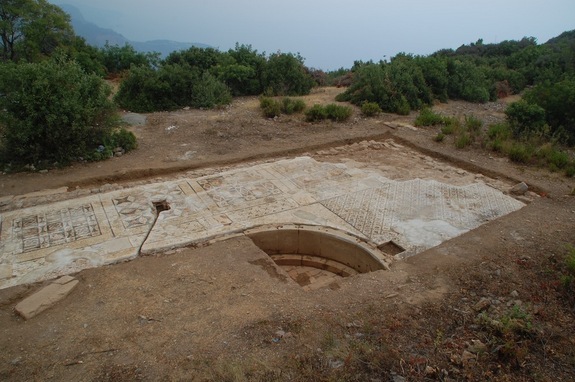 The find was brought to the attention of the archeological museum in Alanya, who two years later made aminor investigation that revealed a small portion of the mosaic. Last year, the museum invited Hoff to clear the mosaic and to preserve it for tourists and scholars. Hoff's 60-person team also included Birol Can, assistant professor of archaeology at Atatürk University in Ezrurum, Turkey, a sister university to the University of Nebraska; students from UNL; other students from Turkey and the United States; and workers from a nearby village. About 35 students participated in the project as part of a summer field school Hoff runs. Hoff said the significance of this summer's discovery has him eager to return to the site and see what the rest of the excavation uncovers. "As an archaeologist, I am always excited to make new discoveries. The fact that this discovery is so large and also not completely uncovered makes it doubly exciting," he said. "I am already looking forward to next year, though I just returned from Turkey."